Market data enables you to define your total addressable market and compare against existing customers. RealZips takes the guesswork out of where to run marketing campaigns and in which areas your team should spend time selling. The screenshot below shows zip codes in Los Angeles with the most full-service restaurants. Compare targets (Full-Service Restaurants) against customers (Accounts Count). Leverage RealZips to manage market data across 1,000 industries, and automatically calculate your team’s market share and growth opportunity. Is your team missing their growth opportunities? Does your team know their geographic hotspots as they connect with customers? Is your team making strategic decisions with no market data in Salesforce? Are geographic areas rich with potential customers left wide open for the competition? Our team will help you find your best-fit market data and support the integration with your existing CRM data. If you want to grow your business fast, then RealZips is definitely the best time & money-saving tool you ever need. Market data from the RealZips app, displayed in MapBusinessOnline. The map shows hotspots of full-service restaurants with 20-49 employees in the Greater Los Angeles area. Use this type of map to overlay market potential across any industry, combined with existing customers, sales territories and target areas, as defined in the RealZips app. Integrate market data with your CRM data and open up endless possibilities to analyze your addressable market. Make it possible for your marketing and sales teams to pinpoint geographic growth opportunities. and accelerate revenue. 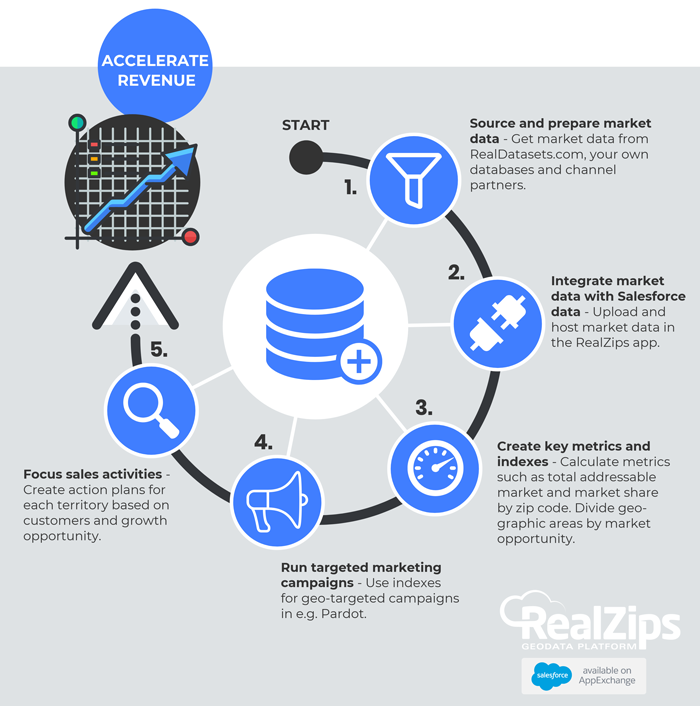 Get started with market data in Salesforce by testing the RealZips app for free. During your trial, we will help you configure the app and provide sample market data at no cost.